Seconds To Enter GTI Global Network. Born in 1990s, GTI Magazine issues 11 editions every year and circulates over 130 countries and regions. 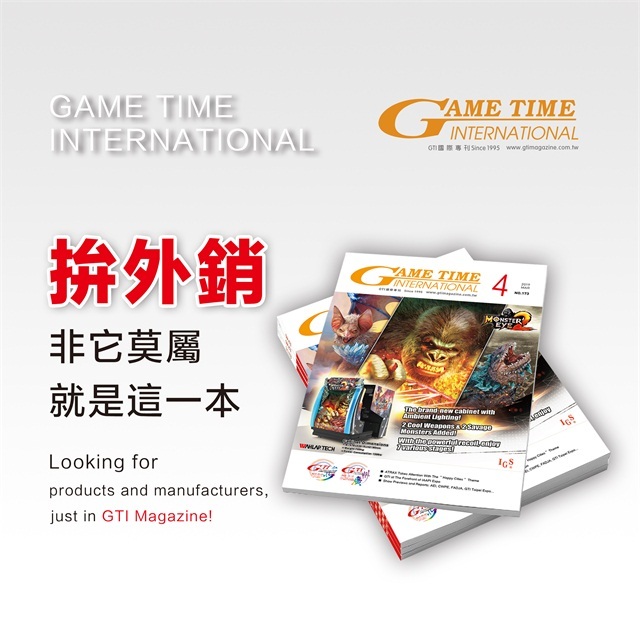 With high profile and pass -along rate in game & amusement industry, it is an outstanding exported magazine in Asia. Also, under the perfect combination of GTI Taipei and Guangzhou expos, magazines as well as website, GTI will provide you with a professional, high-end and precise platform which is with omni-channel! Advertisement in 167th GTI Magazine is coming to meet its deadline on April 17th. Good advertising position is still very much up for grabs! Copyright © 2009~2011 GTI Global Network. All right reserved.广州浩亮策划服务有限公司 版权所有粤ICP备12094534号-2 Power by rIDEA Reproduction of any part of the website should get prior consent in case of legal consequences.